Travel to Turkmenistan :: Tourism in Turkmenistan. Turkmenistan history. Tour to Kunya-Urgench - the Centre of World Heritage. Description: Travel to Turkmenistan. Tour package consists of a combination of historical and architectural components. The ancient city of Kunya-Urgench located near the Uzbek-Turkmen border, once the capital of the Khorezm Empire, is a center of World Heritage including Kutlug Timur, the tallest minaret in Central Asia and the Turabek-Khanym Mausoleum. Its 12th century dome is probably the most spherical and perfect of the Turan, and is one of very few tiled domes of that age worldwide. 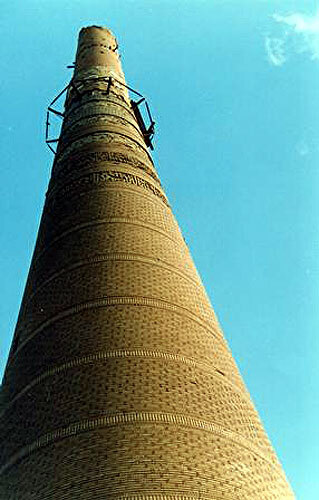 Kunya Urgench is striking, with its characteristic conical domes later to be copied in Bukhara. Day 1: Breakfast. Transfer to airport for morning flight to Nukus. Arrival at Nukus airport, Karakalpakistan. Transfer to hotel/private apartments and accommodation. Lunch. City tour: Museum of Art named after I.V.Savitskiy, which will open to you the culture of this region, also containing a unique collection of Russian Avant-garde works, Mizdahkan - An Islamic complex in Hojeli village (15 km), Gyaur Kala - up to the present day archeologists have been making excavations in this region. Dinner. Overnight in Nukus. Day 2: Breakfast. Crossing the Uzbek-Turkmen border at Shavat. After customs formalities, drive to Kunya-Urgench for tour. Excursions in Kunya-Urgench, once the capital of the Khorezm Empire. Visits to such historical monuments as Kutlug Timur, the tallest minaret in Central Asia, and the Turabek-Khanym Mausoleum. Drive to Dashoguz town. Late lunch at Nadira Restaurant. Afternoon visit to the Museum of History & Ethnography in Dashoguz. There you will observe the custom and dress of the Chovdour and Yomud tribes. Dinner and overnight at hotel. Day 3: Breakfast at the hotel restaurant. Drive to the "Shavat" border crossing. Cross the Turkmen-Uzbek border. Transfer to the Urgench Airport for return morning flight to Tashkent or take daily excursion around Khiva and evening flight to Tashkent (optional). Arrival Tashkent Airport. Transfer to hotel. 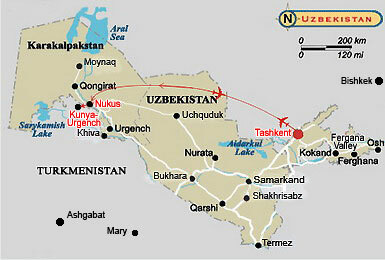 You can add this extension to any Historical, Cultural, Architectural or Adventure tour in Uzbekistan. Our tour operator will work closely with you or your travel agent to carefully prepare an itinerary based on your stated interests.